While I have no hard data to back up the supposition, it seems to me that Esterbrook’s success in fountain pens from their start in the 1930s through to the stumbling point in the late ’50s had as much to do with the Renew-Point system as the quality of the pen bodies, or Re-New-Point as it was known until about 1948 (the change possibly due to the post-war hyphen shortage). Back in the day, you would go down around the pen shop, and if you were in an Esterbrook mood, you could choose the colour of pen you liked best, then select from a separate rack entirely which point you thought would suit your writing best. The point and feed screw into the section as a unit, and if you’re a mercurial writer, you can keep several points around to fit to the day’s fancy. This was not a trick known only to Esterbrook, as Sheaffer dabbled in it a little and Osmiroid pursued it fairly vigorously– in fact, the latter’s points will fit an Estie and vice versa, giving the modern owner a very broad range of selection indeed. From a retail standpoint, the investment in both money and space was attractive. Rather than having to carry a huge range of pens, a few examples of each body colour and point would allow the appearance of a complete stock of everything Esterbrook made. This allowed Esterbrook to go slightly cheap on the points, too. Rather than having to use expensive tipping, they could use self-tipped points. These wore down more briskly but with easy and cheap replacement, no one complained with any great force. If one were inclined to move the pen (slightly) upscale, there were tipped options available. 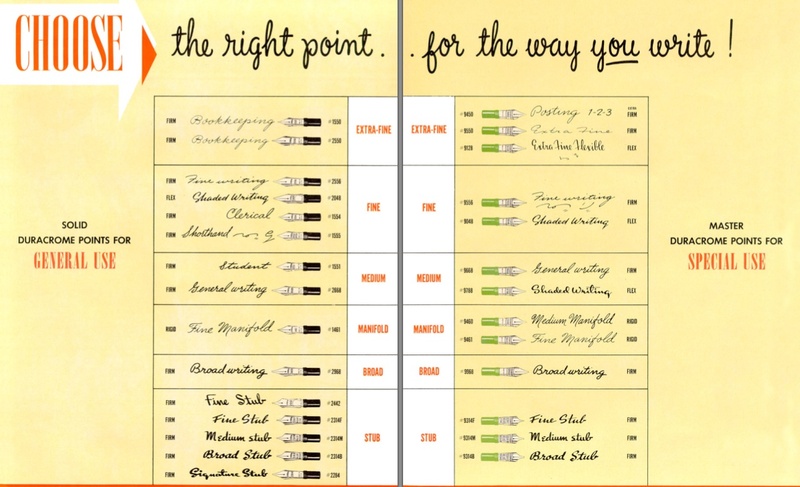 Easily replaced points must also have been a motivator for institutions like banks and hotels, where the pens might be used by anyone, and would certainly see a lot of mileage. Interchangeable points must have seemed pretty obvious to Esterbrook, who had spent the previous 75 years making pens in the original sense; little bits of metal which attached to a pen-holder, which were easily and frequently replaced. The catalogue numbers on a lot of the Renew-Points reflect the pre-existing dip pens upon which they were based; for example , the Esterbrook Falcon Point is numbered 048, and the Renew-Point Falcon Flexible is 2048. There were several series of points, which roughly suggest the relative worth of the unit. 1000 and 2000 series units were the low-end of the scale, puffed up in advertising as being made of “Solid Durachrome”. 3000 units were an early example of the upscale tipped versions, produced in the late 1930s and apparently very briefly; if you hear of a “sunburst point”, it is a reference to the decorative impression on the back of the 3000 series. During the war, when precious metals were easier to come by than steel, Esterbrook offered an 8000 series in a palladium alloy. After the war, the tipped points were resurrected as the 9000 “Master Series”, and a very lucky seeker may come upon one of the short-lived 6000 series which emulated the conical shape of Sheaffer’s “Triumph” point. Note that there are also 5000 and 7000 series points, specifically designed to fit into Dip-Less sets. While later Dip-Less sets are arranged to accept any of the points mentioned here, these two types of point will not work in a fountain pen body, as the feed has no channel to bring ink from the reservoir to the point. One can approximately date a Renew-Point by the shape of the feed. Prior to 1950, the feeds were relatively low-profile and primitive-looking, while afterwards they had large, almost military-looking feed with large vanes on it. It seems that the older the unit, the lower a profile it has, with the earliest examples being very thin affairs indeed. Cost when new: 25¢ to 50¢ in 1935, up to 60¢ to $1.15 by 1960 (for modern values, try this calculator). I’ve seen some sources suggesting they were in production as late as 1971, but have no prices.